World-leading manufacturer of off-road vehicles, Polaris has announced a range of permanent price reductions across the entire Ranger line-up to deliver even greater value for customers. The new price offer comes on the back of the hugely successful launch of the all-new Ranger 900 XP to expand Polaris’ side x side offering to a phenomenal 16 models. Polaris Australia & New Zealand Country Manager, Brad Wolstenholme observes that the Ranger line-up, with 16 models encompassing diesel, petrol and electric engines and a range of seating configurations, is not only characterised by the breadth and depth of the range and its unique capabilities, but also the industry-leading value for money it offers customers from Australian farmers to recreational users. Polaris’ Ranger 900 Diesel has enjoyed astronomical success in the Australian market to become one of the country’s highest-selling side x side vehicles. 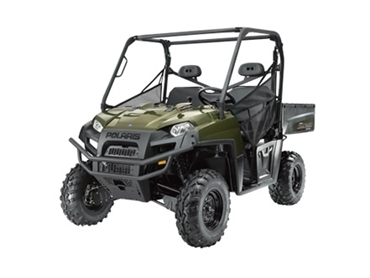 The Ranger 900 Diesel is now available with a permanent price reduction of $3,000 in addition to $1,000 of free accessories until the end of August 2013. The Ranger 400, a popular side x side in the 500cc or below category in Australia is now available with a saving of $1,500 while the Ranger 500EFI will come with a saving of $1,600. The Ranger 800 has been reduced in price by $3,000 while the all-new Ranger 900 XP is available at a special introductory price. There have been price reductions across the six-seater Ranger Crew line-up, with the Crew 500EFI reduced by $1,500, the Crew 800 by $3,500 and the 900 Diesel Crew by $5,000. Polaris has also taken the opportunity to re-launch the Ranger EV, an electric Ranger variant featuring an AC electric motor, 40kmph top speed, On Demand True All-Wheel Drive, 454kg payload and 567kg towing capacity. Positioned as a clear market leader in government, commercial and private applications, the Ranger EV has had its price reduced by $2,000. Side x side vehicles continue to represent the fastest growing segment of the Australian ATV market, with Polaris leading in this category at 49% share of the national market based on the past 12 months’ sales until the end of June 2013, according to industry data specialists DataMotive. A recognised leader in the powersports industry with annual sales exceeding $3 billion, Polaris designs, engineers, manufactures and markets innovative, high quality off-road vehicles (ORVs), including all-terrain vehicles (ATVs) and the Polaris Ranger side-by-side vehicles, snowmobiles, motorcycles and on-road electric/hybrid powered vehicles.